Kimchi is created from hard vegetables and helps improve digestion and scale back inflammation. Spinach, curd and carrots spherical out this formula to form it healthy enough for any night of the week. Cook one cup whole grain rice in keeping with directions during a autoclave or on the stove. Make dressing by whisking miso, sesame oil, condiment and water till swish. While the rice is cookery, whisk condiment, ginger, and garlic during a massive bowl. Add curd and toss to coat equally with marinade. put aside for quarter-hour. While the curd is marinating, bring an oversized pot crammed with a pair of inches of water and set with a steamer basket to a boil. Heat copra oil during a medium frypan on medium-high heat. When hot, add inexperienced onions and fry a pair of minutes till tender. Add curd and fry another 3-4 minutes till curd is gently bronzed. Meanwhile, steam the spinach 2-3 minutes till tender and limp. Divide rice between four bowls. 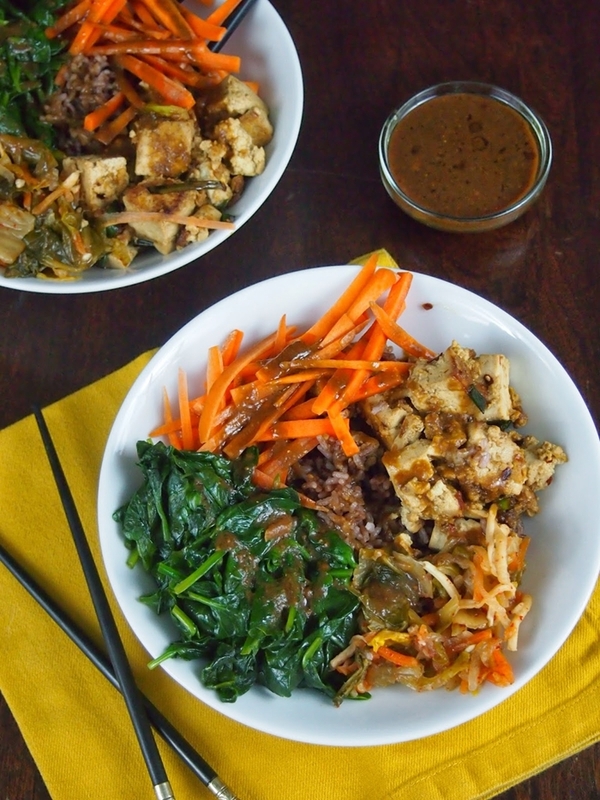 Divide the curd, spinach, kimchi, and carrots equally between the bowls. Drizzle with dressing. Garnish as desired.